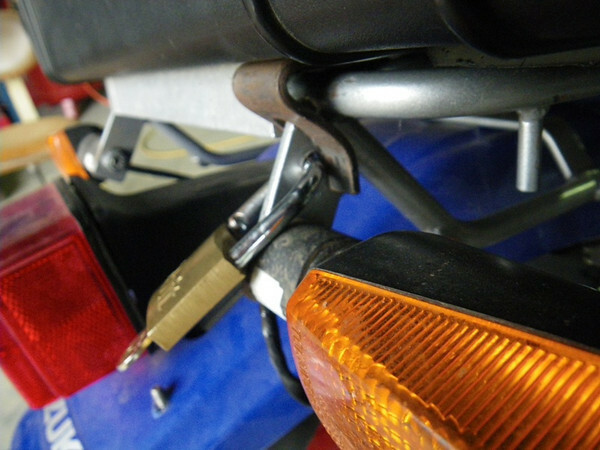 The motorcycle for this ride is a 2008 Suzuki DR650. 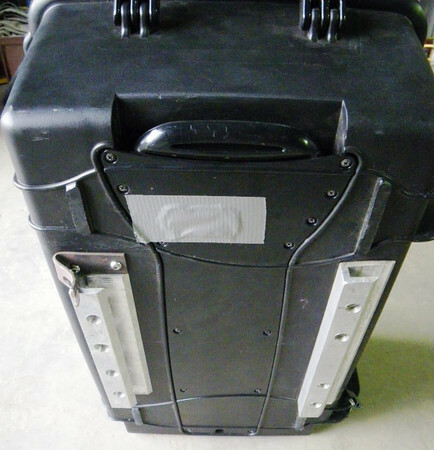 I will add more details, especially about the side racks & bags, top case, side covers later. I butchered part of a sheet metal hand brake to make mounts for the top case. 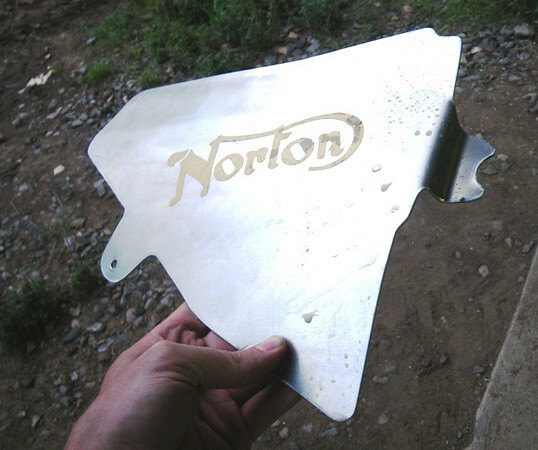 That’s a big chunk of aluminum. The gap in there is 1/2″ — it fits over the top rack tubing perfectly. Using an end mill, I milled out the diagonal part. Then drilled & countersunk holes, and through-bolted it to the case. 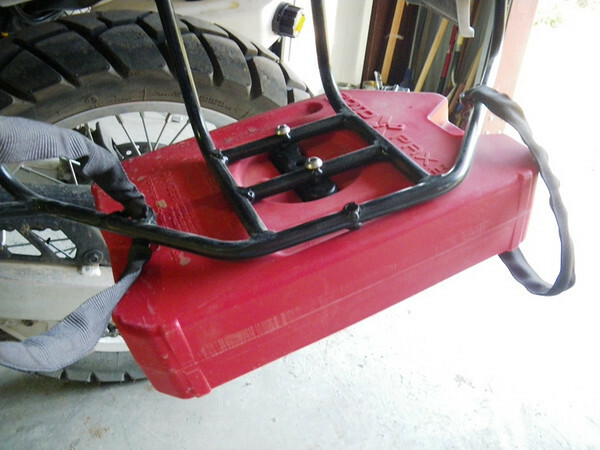 The front of the case/front of the motorcycle is to the right. The C-shaped aluminum channels slide over the top rack tubes. 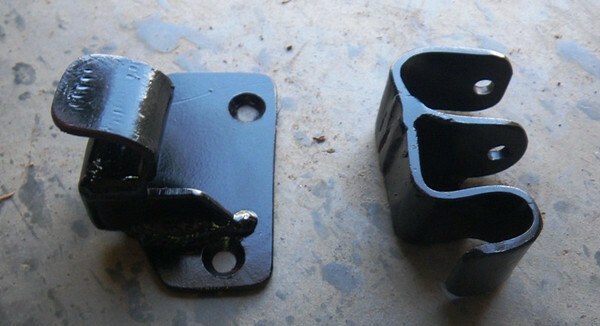 The tang of metal in the upper-left of the box will serve as a hasp to lock it in place. But first…notice that there is a handle at the top of the case? And the compartment where the retractable handle was located? I removed the extending handle, sawed off the very top of the handle, and epoxied it in place. In the remaining space I have: replacement wheel bearings, fork seals, spark plugs, JB weld, front sprocket, krazy glue, hi-temp RTV silicone, oil filter o-rings, oil drain plug crush washers, front brake pads. The tang of metal slides over part of the rack, which I drilled to accept a padlock, arresting any rearward movement of the case. My goal was to have a rack for lashing down the Ortlieb bags, and also carry Rotopax cans. They are made from 1/2″ CroMo steel tubing. 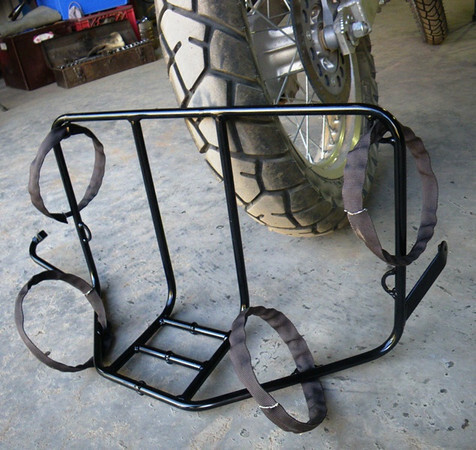 All of the following photos are of the left side rack. 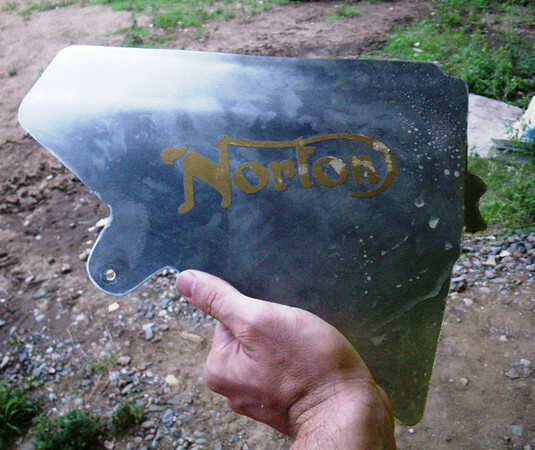 The general dimensions are about 11″ x 21″ x 7″. All bends were made with a hand bender (with the help of a sturdy vise and a cheater bar). The D-rings from hefty steel pipe — sectioned and those sections cut in half. The 1/2″ pipe pieces were birdmouthed using an end mill, then everything was welded together. 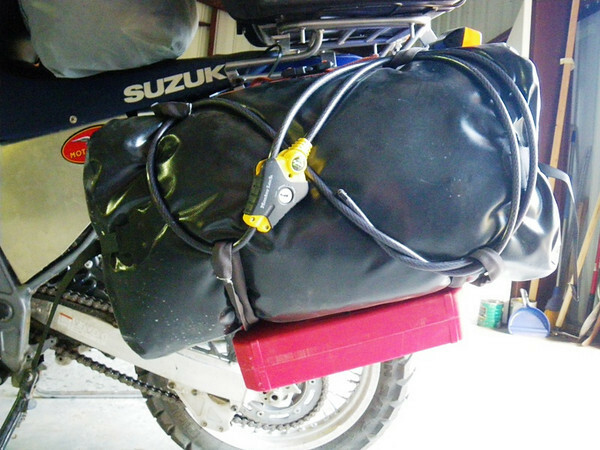 The straps are 1″ tubular polypropylene webbing, reinforced with vinyl-coated 3/32″ steel cable inside. The cable loops were swaged with aluminum fittings and a hand swager. It’s difficult to see, but I also added an adjustable strap across the two top straps to help tighten everything up. 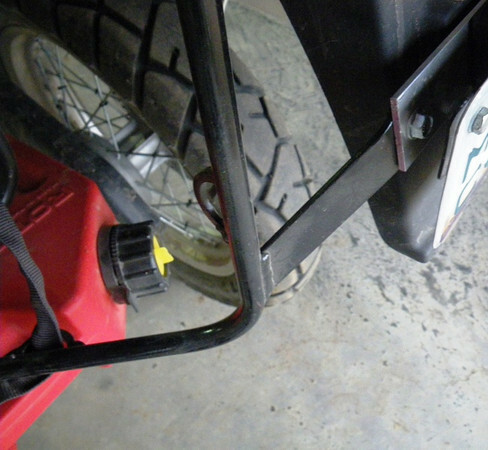 It is held in place with the pin from the passenger peg, the peg drilled & held in place with a kotter pin. The left piece mounts where the OEM toolkit used to live. The right piece goes over the frame rail. 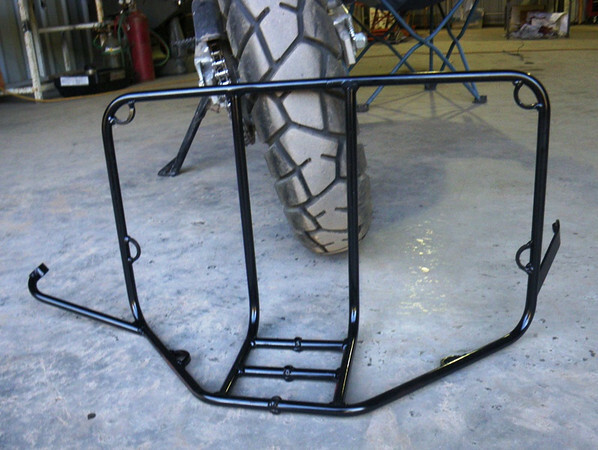 The top tube of the racks lays in the hooks, then the rack is swung into place, attaching at the footpeg and rear fender. Made from the same aluminum as the sidecovers, this is bolted to the windshield bracketry, and was sandblasted to reduce glare. The forward edge is covered with trim so it doesn’t saw through the windshield. Left to right: On/Off switch for low beam, 12vdc socket, Veypor computer, and cheapest waterproof watch I could find. 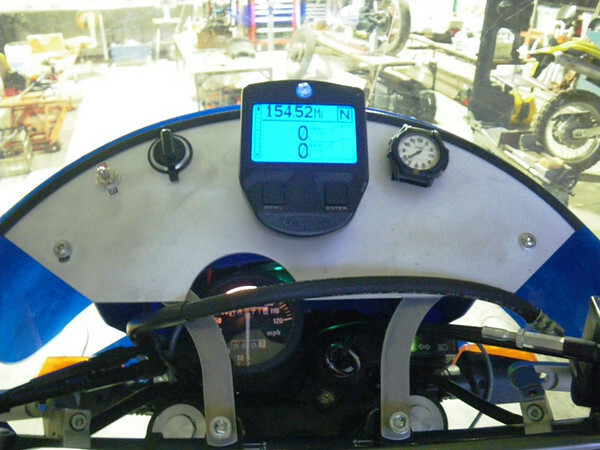 The computer is attached to a block of delrin, which is bolted to the dash. The watch is attached with hook-and-loop tape. I painted the lower portion of the windshield with blue Krylon rattlecan, masking off portions so the turn signals are not obscured. 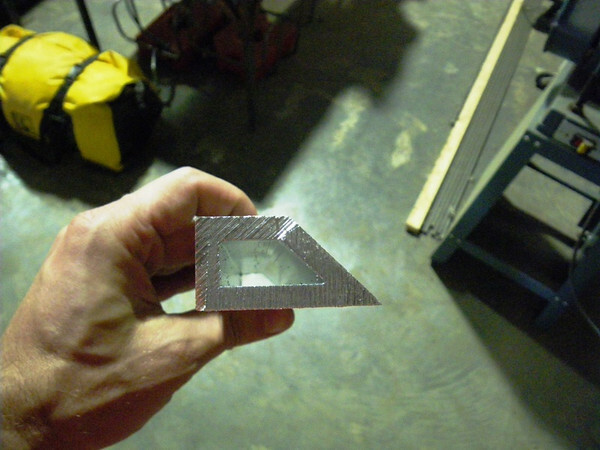 Let me say this: It helps…really helps..to have a good welder on your support team. #1 | Written by Rich Staab about 9 years ago. #2 | Written by A Vuokra about 8 years ago. 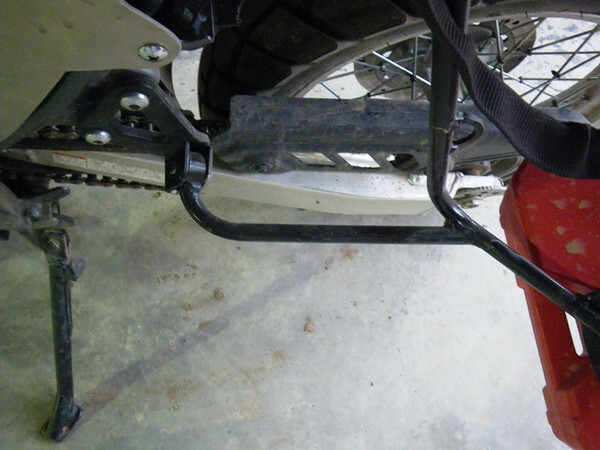 Good article, I added a Lust Racing jack up kit to increase the ground clearance on my adventure bike. Swapping dogbones to heavy duty ones was really well worth it. No probs riding off road, got an important extra inch in ground clearance. Thumbs up for your nice write up.